If you are considering something different, underwater weddings, ski slopes and even old castles are all possible for the right price. Castles in Ireland with crumbling walls are romantic and hauntingly beautiful. African resorts with open air lodging are the perfect venue for a wedding full of surprises like elephants wandering through or monkeys watching your procession. High class and high drama come with weddings in places like Trump Towers. You could hedge your bets on your wedding vows in Vegas or have a clean air wedding in the highlands of the Appalachian Mountains. Tiny chapels in the Smoky Mountains hold generations of wedding vows. 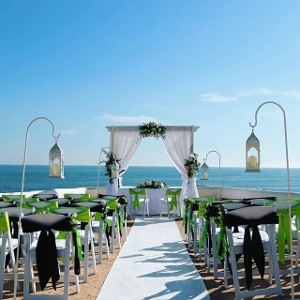 Island weddings are the perfect wedding venues for those who love sand and sun and fun. Islanders love to celebrate with steel drums and huge platters of tropical treats for your big day. Old factories loaded with history and hardwood floors are just the place for those wanting expansive space to dance. Posh New York nightclubs where the music is bumping and vows must be mimed out are just what some little girls have imagined for their big day. No matter what kind of life you live, it is easy to incorporate what you love into the perfect wedding venues. If you are athletic, say your vows on the 50 yard line or underneath the goal, dressed in your favorite team colors. Have tapas at your reception in your favorite restaurant in Spain. The hardest part of picking a venue is letting your imagination run free. Go ahead and dream up a divine wedding.